Pregnancy changes the body in many ways. Most of these changes are positive, meant to keep both mother and the baby healthy. But there is one common, unwelcome change: according to the American Physical Therapy Association, between 50-70% of women will experience low back pain and 45% or more experience pelvic girdle pain during or after pregnancy. Many different factors contribute to pain: hormonal changes decrease stability in joints and ligaments, and due to the changes that happen in the body, posture and center of gravity change. Additionally, women are increasingly more active when they have their first child; a mother-to-be is balancing many different demands and pursuits. 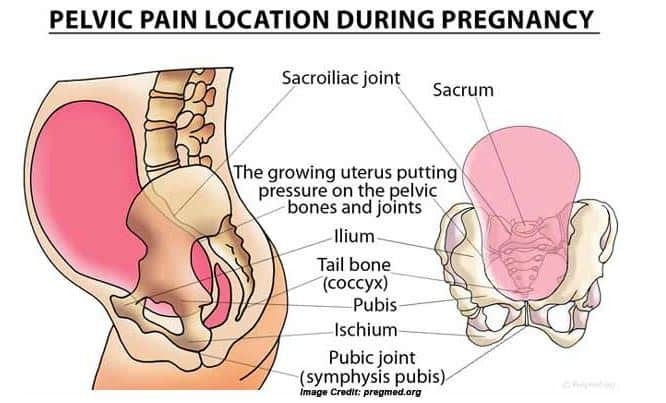 Pain during pregnancy can manifest itself in several areas of the body such as the lumbar spine, sacroiliac joints (pelvis), or pubic symphysis. Back and pelvic pain can appear during any trimester of pregnancy. Treatment of pain during pregnancy involves not only pain relief, but treating what is causing the symptoms in the first place. By evaluating posture and movement patterns in sitting, standing, transfers (such as getting out of a chair or out of bed), walking, and even the position we sleep in, changes that contribute to pain can be identified and corrected. Education on bending, lifting and carrying can help reduce pain and also prevent new symptoms. It is also important to assess an individual’s workstation and make ergonomic changes to help promote good posture and position throughout the day. During pregnancy, the hormone relaxin is produced to help prepare the body for childbirth. It causes the ligaments in the pelvis to relax and loosens the soft tissue. While important, this can also result in increased stress through the joints of the low back and pelvis. This can result in asymmetry in the position of the pelvis and inflammation in the joints. Essentially, the body can’t support itself without overloading pain sensitive structures. All of these factors can produce pain. An important part of strength training in prepartum and postpartum women is pelvic floor strengthening. The pelvic floor muscles form the base of your pelvis and work to support the spine, support the internal organs, and maintain bladder and bowel control. Strengthening the pelvic floor can treat pain and discomfort, help with delivery, and prevent problems postpartum. Stress incontinence is experienced by up to 35% of new mothers in the postpartum period and retraining the pelvic floor can both treat and prevent problems with urinary incontinence. Pelvic floor exercises should be started as early as possible to be the most effective. When retraining the pelvic floor it is important to perform both fast holds and long sustained holds of these muscles. Quality is much more important than quantity and it is important to make sure you are able to contract the right muscles. Pain can negatively impact what should be a joyous time. The important thing to remember is that pelvic girdle and low back pain during pregnancy is treatable. By addressing both what is causing the pain as well as providing strategies to reduce pain, physical therapy can help you stay active and healthy throughout all stages of pregnancy. If you’re pregnant or postpartum, live in the Portland, Oregon area and experiencing pain or urinary incontinence, contact us at 503-295-2585 and one of our talented clinical team members can do an assessment and prescribe a customized program for you. If you live outside the Portland area, please visit apta.org to find a qualified physical therapist in your area. And read our blog on How to Find a Good PT.